Prabal Gurung for Target floral blouse, BCBG Girls skirt, Luella distressed leather jacket (similar here), Susan Farber bow clutch (similar here), Cat-eye sunglasses c/o BCBG Max Azria, Hue tights, ASOS platform heels. Last Sunday, Lauren and I -- along with a few of our friends -- woke up at 6am, rented a Zipcar and drove to Target in Queens to scoop up as many Prabal for Target items as we could get our hands on. This was in addition to placing several online orders as a few of the shoes were exclusively online-only. I will be honest with you, I bought five pairs. I know that seems like a lot, and my mother who is reading this is definitely shaking her head. Her last piece of advice was to sell a pair of shoes for every new pair that I buy, but for some reason I find that to be a really hard thing to do. Luckily, the genius of shopping at Target is that I was able to buy five pairs for shoes for under $200. Sadly, the quality of the majority of the clothing collection wasn't great. Lauren and I both got our hands on the two standout pieces, the tank shown above and in my case a seriously badass sweatshirt with the same jungle print. The shoes were much better quality and only adds to the justification of my insane online order. Did anyone else manage to get their hands on the Prabal for Target collection? What did you think about the quality? I don't know this brand, but I like this look. It has something "messy", but it looks really stylish! Totally love that skirt!! And ofcourse the prabal gurung shirt, amazing look! Too bad there wasn't a target nearby! I don't know this brand. I really like this outfit, especially the skirt. Haven't tried Prabal Gurung for Target yet, but I love this outfit! Obsessed with biker jackets and I especially love yours with the distressed leather. love the print mixing here! Love the whole look esp that skirt! YES I am waiting for my dress to come in! I'm getting impatient especially seeing instagram pictures of everyones orders arriving UGH!!! I didn't pick anything up for that reason...the quality with the past Target/designer collabs just didn't seem worth it. Glad your shoes were a much better score! Are they true to size? love the pleating in your skirt! Wow! Love how you took the feminine floral blouse from this very girly collection and styled it in such an edgy way! Now I am rethinking the blouse...haha :) I agree with you on the soso quality of the clothes but the much better quality of the shoes (probably why I snagged 3 pairs of shoes and no clothing items). Loving your layered skirt too! Loving that layered look on your skirt! Awesome outfit, loving your shirt; all I bought from the collection is two pairs of ankle shoes. No Target in Scandinavia :( But I do go there to browse and shop when I´m in the US. 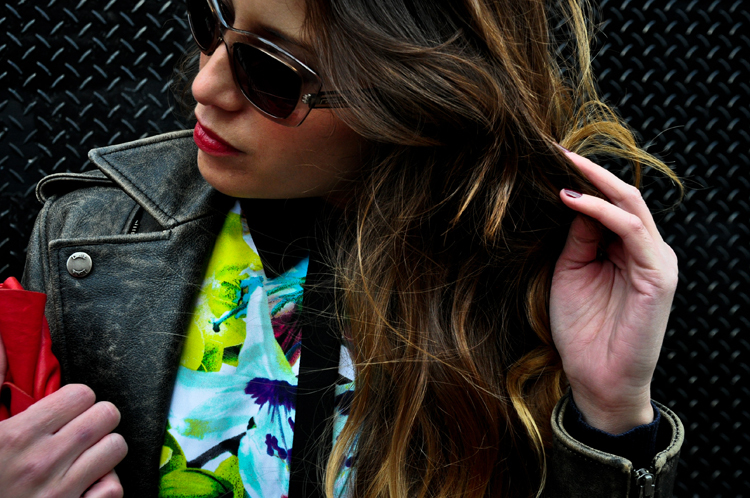 I love this outfit, the floral shirt balances the edginess of the leather jacket (fab jacket!) and I´m a big fan of the opaque tights. I guess living in a colder country makes this a necessity rather than vanity! I love these layers! And the colors! Your skirt and floral top are super nice! Loving the vintage worn look of the jacket, contrasting the feminine floral top, excellent! Thanks for the comment dear. Awesome outfit. Really loved the whole thing here. loving all the paired textures in this look! Love this look! I picked up this shirt and the lime sandals! Love how Lauren styled it! That skirt is amaze! Perfect leather jacket! And cutest red bow clutch!!! !